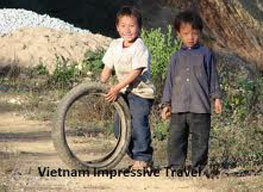 Our staff and bus pick you up at your hotel/travel agency and transfer to Hanoi train station. 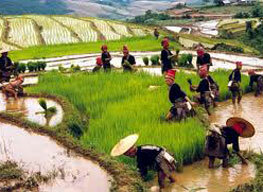 Take the night train to Lao Cai. Get up the pick-up again when the train arrives at Lao Cai Train station and our guide will meet you and take you to a restaurant near by for breakfast. After that we get the tour itinerary reconfirmed by the guide and then we start our trip to Cao Son Market by a van or car. It takes 2 hours to get there. 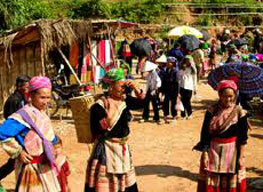 You might encounter Giay tribe in the traditional dress in Ban Lau or Thanh Binh. Reaching Cao Son at about 10am, enjoy the excitement of this weekly market. 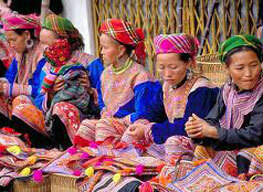 The shining dresses of colorful Homong people attract you much as you fall down to a new world – the world of interest and fun. Picnic lunch is served after the visit to Ngai Phong Cho village – the habitat of Flower Hmong tribe. The afternoon, you will surely be impressed by the magnificent landscapes of Chay river and lofty mountain ranges en route Cao Son – Coc Ly. Arriving Coc Ly, a boat trip is on offer to visit the awesome Fairy cave and charmingly – located village tribe. At the end of the river tour we depart for Lao Cai and stop at the International Friendship Bridge of Lao Cai to have a look across into China. From here, we continue the trip up the high pass to Sapa, arriving at the hotel in the late afternoon. We get our hotel check in and have dinner in the restaurant. Get up in the morning for breakfast and check out the hotel room, your bags will be put in the hotel luggage store again. We start the trip at 9am with the guide. 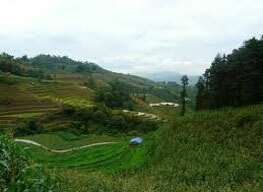 We will walk about 15kms, visit three different villages belonging to the Black H`mong, Dzay and Red Dzao people. 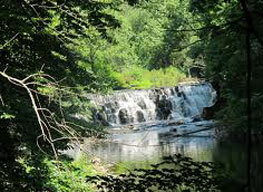 We guide you along waterfall, rice fields and a small river in a lush valley with sweeping landscapes. This tour has the option of lunch in a minority home or pack lunch from the hotel at a picturesque location. We will get the pick up by van/ bus after visiting the last village. Please contact us for the best price !